Since the very beginning, our God has made clear His rhythm of restoration. The Creator works to restore His creation and His people and in doing so, brings us full circle, back into right relationship with Him. And yet while God promises this restoration, the way in which He repairs the world’s brokenness is not always as clear - sometimes it is even hidden. But here and there, from time to time, we are blessed with glimpses of His movements and His care in even the smallest of details. Never through the plan we might expect, yet always with a greater ending. When Megan Elkins first visited South Sudan with His Voice Global over a decade ago, she knew she had found a specific calling. She had just graduated from college with a nursing degree and joined the HVG team to help with medical missions in South Sudan, where the organization was partnering with the local, Evangelical Presbyterian Church (EPC) to start two orphanages, a primary school, and secondary school. That trip turned into several more in the following years as Megan continued to come back to South Sudan to help provide medical services. On her second trip in 2006, Megan went to spend time with kids at the Morobo Orphanage. “We went there just to be with them and love on them, but there were some special cases of kids who needed further medical care,” she says. One of these special cases was for a young boy named Isaac who had been severely burned as a toddler, leaving his upper arm connected to his forearm and limiting any further growth. As soon as Megan returned home from this trip, she began to seek out ways to help Isaac, eventually finding a doctor based in Kijabe, Kenya, who was willing to see Isaac and perform surgery on his arm. The next year, Megan and her friend, Robin, accompanied Isaac to Kenya for surgery. The two young American girls and a South Sudanese boy in a brand new country made an odd group, but it’s difficult for parents or guardians in South Sudan to leave their work to make such a long and costly trip. “I bet we were a sight,” Megan jokes. The surgeries were successful, and Isaac and Megan returned to their individual lives, yet the experience created a bond between the two. Megan eventually married her husband, Mike, and the couple quickly knew they wanted to work in full-time missions. They looked seriously at moving to South Sudan, and worked to make connections there, but the right doors never opened, especially after the country’s Civil War broke out in 2013. Mike, a pilot by trade, was given the opportunity to work in aviation missions in Northern Uganda and the Elkins hoped this would provide them with opportunities to continue to visit South Sudan and the people they loved so dearly. Desiring to remain faithful to where doors had opened for them, Megan, Mike and their two boys, Keene and Kohen, moved to Arua, Uganda in January of 2015. "Little did we know there would be 1 million refugees coming into our area in Northern Uganda,” Megan says. 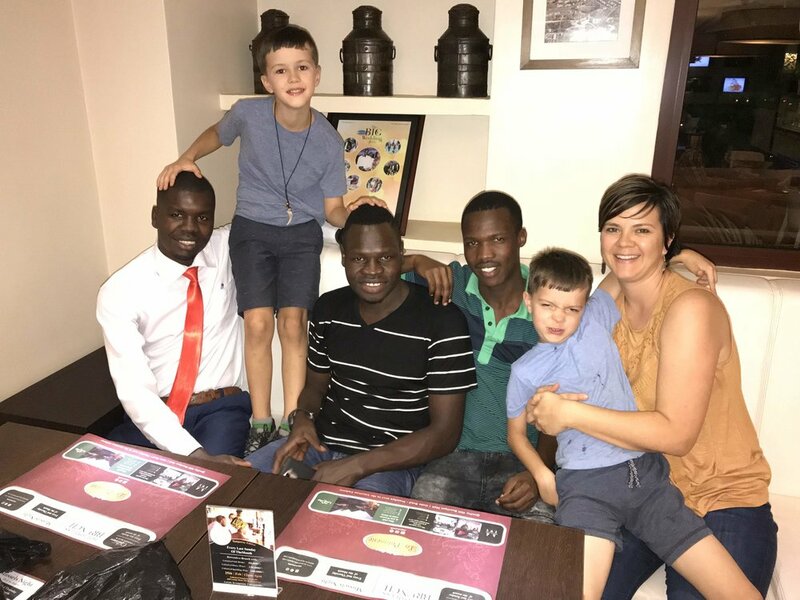 In addition to the large number of South Sudanese refugees flooding the Ugandan borders who needed care, several of the kids Megan first met at the orphanages in 2005 were now moving to Uganda to attend University. His Voice Global quickly realized the need for holistic care for these kids could not stop after secondary school. A university or trade school education would be vital in empowering South Sudanese orphans to flourish once on their own. Soon, Megan and Mike found they were exactly where they needed to be: providing a place of comfort and peace for kids that were for the first time, far from the only home they had ever known. The Elkins began to check in on the students who were in Arua and Kampala for college, and it didn’t take long until many of them asked if they could stay with the family over the holidays. “It kind of organically started that we were spending more time with them,” Megan says. For many of the students coming from South Sudan, a family support structure back home is minimal or nonexistent. Megan and Mike offer a place of rest, wisdom, and care that is still essential as these students are finding their way in the world. The Elkins have not only felt the need to provide support for college students, however. Just a few months after they moved to Uganda in 2015, the family heard Isaac was struggling in South Sudan. They extended an offer for him to come live with them and finish his secondary schooling in Arua without hesitation. God’s work of restoration never looks quite like we expect it to, and yet the glimpses we receive always exceed our expectations. The Elkins currently have two university students living full-time with them, and Megan serves as the care coordinator for all 11 students enrolled in University in Uganda. This role takes on a variety of responsibilities, as Megan herself is learning how to navigate the diverse and varied school systems and aid each student with payments, registration and settling in an entirely new country. There are eight more HVG supported, prospective students who could potentially be in Uganda next year. With growing enrollment, land near the Elkins home has been purchased in order to build housing for the university students in Arua and temporary housing for those students who will stay with them during school breaks. The Elkins and HVG hope the Arise Discipleship Center will become a place where discipleship courses and ongoing counseling can be offered as additional means of restoration for college students sponsored by and involved in HVG programs. Megan knows what a crucial time University is in the life of these kids. While many mission organizations tend to pour into children during their early years, there is still a need to support kids, especially orphans, during their early twenties. The holistic goals of HVG drive the need for this further care. Support of full restoration so the kids from South Sudan can not only succeed themselves but also pour back into others is something Megan has witnessed first hand over the years. Megan says her day to day usually looks pretty boring and mundane: filled with homeschooling and a lot of cooking, the Elkins house is also usually crowded with student or missionary visitors. Although not always glamorous, and sometimes exhausting, Megan still speaks about each of the students she continues to pour into with the tenderness of a mother who hopes the best for her children. Whether God’s work is made evident to us or remains hidden, rarely does it look like we anticipate. For God often embraces the mundane and the small details like washing dishes, helping with homework, and creating a place of warmth and comfort to point us back to His goodness and bring us full circle into His restoration.